Concor Western Cape has again proved itself a world class contractor by winning three out of the five building categories in the Master Builders Association Western Cape (MBAWC) 2018 Regional Safety Competition. Mark Fugard, managing director of Concor Western Cape, says that these accolades from the MBAWC is an acknowledgement and recognition of the exemplary health, safety and environmental programme that the company has in place across all its sites. “Safety is more than a watch word for Concor, with the highest level of commitment from management to our Stop.Think.Act! philosophy. It is about remaining focused on our objective of Zero Harm while delivering quality projects,” he says. In Category D for project values between R14 million and R40 million, Concor Western Cape was placed first for its Signature Lux project. This project scope involved internal demolition and stripping out of an extremely old heritage status six storey building and converting the building into an 88 key Signature Lux hotel. Fugard says that although challenging at times the project has progressed well and is scheduled to take its first guests in September this year. For the second year in a row, the company’s 16 Nettleton Road project was placed first in Category F which covers projects from R100 million to R150 million. The project scope is for the construction of a luxury residential house constructed over seven levels on the steeply inclined seaward side of Nettleton Road, Clifton. This has been a complex project with one of the many challenges being the need to anchor the structure to the shear mountain slope at regular intervals. The project is now entering the very detailed finishing stages. Completion is scheduled for early next year at which stage a new standard of luxury residential construction will have been achieved. 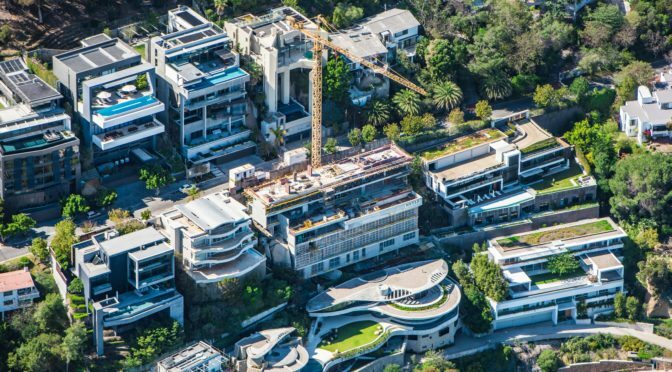 The Aurum luxury lifestyle development in Bantry Bay scored another first for Concor Western Cape, this time in Category G for project values from R250million to R450million. This well publicised project includes building on each side of the busy Victoria Road with the sumptuous Presidential Residences cascading down to the water’s edge below the road, and the 15 plush Luxury Residences climbing the hill above the road. “Safety is a key performance requirement on the project with traffic and pedestrian management and control vital to project performance success, considering the constant heavy flow of vehicular and pedestrian traffic passing the site,” Fugard says. During construction use was made of closed-circuit cameras focused on various points on the road between the two buildings to ensure that traffic and pedestrian behaviour was closely monitored and that construction staff managed the traffic flow while accepting the necessary deliveries of concrete, bricks and other materials. “We believe that securing these awards further underpins Concor Western Cape’s capabilities in terms of delivering complex projects on time, within budget and most importantly safely. We are also extremely proud to have these projects represent Concor in the Master Builders South Africa (MBSA) National Safety Competition,” Fugard concludes.